I've been settling in my new studio space for the past couple of weeks and couldn't wait to start on a quilting project. It's not that I don't already have a few neglected projects from the past couple of years, I just needed wanted something fresh. Sarah from House of Krom, blogger, flickr friend & fellow homeschooler had just the new project to tantalize my senses and get me started on the right foot. 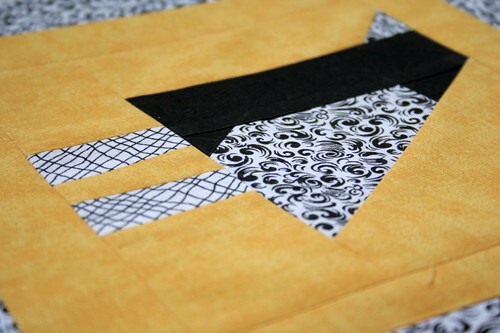 She is doing a free piecing study for the first 10 months of 2011 with another blogger Molly. Free piecing is a part of the liberated quiltmaking process of which I am a huge fan. You can check out Sarah's blog post here for some information links. I am joining late but I don't think it matters too much as you work at your own pace. I'm also taking on a theme for this study: halloween. I've always wanted to make a halloween quilt but seem to run out of time nearing fall. By starting early I just may just finish in time ;) In the first month (January) they started with the mondo bird. 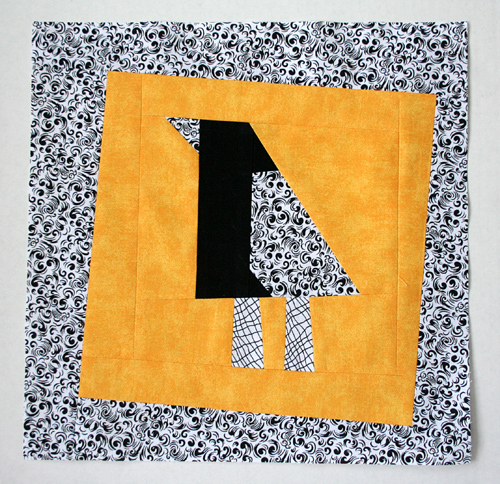 In my block I was thinking of a black bird and I really like how the black, white & yellow play up the mondo bird. Gives it that wee bit'o creepy/cuteness - terrifying isn't it? It isn't too late to join, there are no sign ups, just come play along and as always upload your photos to the flickr group here. Yay! great bird! I am behind in those free piecing blocks..but hope to catch up, maybe today. hi alex... yes, join in. i'm catching up myself and so far i'm having a lot of fun with it.